PRC releases the complete list of passers of Dentist Licensure Examination(June 2015). The topnotchers of the said exam in (Practical Phase) on June 2015 are posted below, please scroll down the page to see the top 10 passers. PRC said that the registration for the issuance of Professional Identification Card (ID) and Certificate of Registration will be on July 8 to 10. 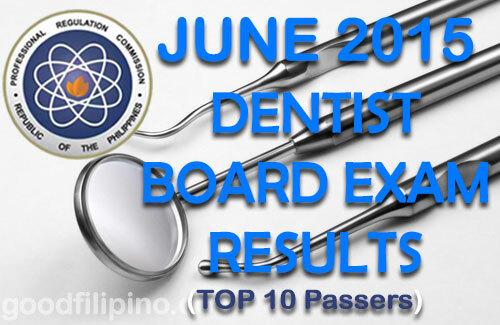 Comments or suggestions about "Top 10 Dentist Board Exam Passers (June 2015) - Dentist Exam Passers (June 2015)" is important to us, you may share it by using the comment box below.